Thanks to Avid's new Open I/O SDK, the HDX-SDI and HD Express are compatible with — and fully certified for — Media Composer® 6.5, Symphony® 6.5, and NewsCutter® 10.5. The HDX-SDI and HD Express deliver uncompressed, full-raster 1080/720 HD or SD video to and from the computer, allowing you to capture and play HD/SD material using any video format supported by Media Composer and Avid Media Access®, such as XDCAM, DNxHD, and ProRes. A MOTU video driver installer with Avid support is now available for download. This updated software installer provides compatibility with (and is required for) the Media Composer 6.5 family of products. With the full rack-space HDX-SDI, ingest any uncompressed SDI, HDMI, or component HD source and then capture and edit in your Avid-supported codec of choice, while monitoring your Media Composer timeline on external SDI, HDMI and/or component monitors. 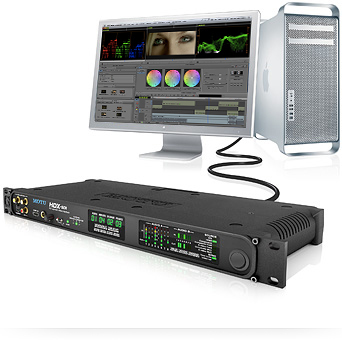 The half-rack HD Express provides all the same video I/O features for those who don't need SDI. Both devices deliver unmatched multi-channel audio I/O features, including embedding and de-embedding, to cover a wide range of audio capture and playback workflows. MOTU video interfaces are the ideal economical, all-in-one video capture and monitoring solutions for Media Composer 6.5 workflows. MOTU and Avid have worked closely together to deliver seamless setup and operation for the HDX-SDI and HD Express with Media Composer using the new Open I/O features in Version 6.5. For a summary of supported features, read this Avid-supplied Hardware I/O Capabilities matrix. Comprehensive HD/SD video capture and monitoring — provides HD and SD capture and playback in all standard SD and HD video formats up to and including 1080p30 (720p, 1080i, 1080p & 1080PsF) for any Avid-qualified PCI- or ExpressCard-equipped computer. Captures and plays uncompressed HD and SD — 10-bit 4:2:2 color depth and 1920x1080 resolution. Tower or laptop operation — connects to an Avid-qualified Mac or PC tower via PCI Express for ultra-fast workstation use, or connects to a laptop via ExpressCard connectivity for mobile operation. SDI capture and monitoring — the HDX-SDI provides uncompressed HD-SDI in and out. HDMI® and component capture and monitoring — both the HDX-SDI and HD Express provide HDMI in and out, as well as full-raster component HD/SD in and out. RS-422 device control — the HDX-SDI takes advantage of Media Composer's device control features via RS-422 9-pin device control for Digital Cut and Batch Capture operations. ASC CDL color grading — provides flexible, industry-standard color adjustment with separate settings for capture and playback. Comprehensive audio I/O • HDX-SDI — with the HDX-SDI, capture or monitor up to 16 channels of audio via any two 8-channel banks of TRS analog, AES/EBU digital or embedded (SDI or HDMI) at sample rates up to 96kHz. 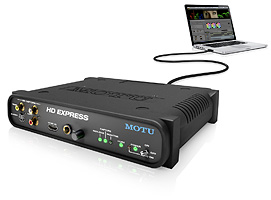 Comprehensive audio I/O • HD Express — With the HD Express, capture 8 channels of embedded HDMI audio. Play back stereo, 5.1 or even 7.1 surround sound directly to powered speakers. Connect speakers, a home theater amp or an audio mixer and monitor your mix in stereo or full 5.1 or 7.1 surround sound. Also provides S/PDIF digital I/O with sample rate conversion. Rack mountable form factor — professional rack-mount operation (full-rack for the HDX-SDI and half-rack for the HD Express), or remove the rack-mount brackets for convenient desktop use.